Looks Almost Like a Native? I woke up this morning at 5am to get to the Feather at around 6:15am. The plan today was going to be swinging flies all day. The day began on the high flow section and although I saw several rises I did not get anything to take. The fish that were rising were in slower water and I'm going to go out on a limb and say that they weren't steelhead, most likely hardhead or pike minnow. After wading down a bit and not getting anything I drove further upstream and fished several riffles and runs that I've never fished before. At this point I decided to go all in and rigged up three flies. At one point I had a nibble but the fish did not commit so there was nothing to set the hook to. I'm about three or four hours in fishing with nothing to show for. Needless to say I was starting to feel a bit discouraged about this steelhead trip. I saddled up, got in my car, and drove further upstream. It was about noonish when I had lunch. After I finished lunch, I geared back up and was ready to give it another go. I fished a run that I've never fished before below the outlet and about midway downstream I get my first take on a swing. The fish jumped straight into the air after it hooked itself and threw the fly. Not fair! 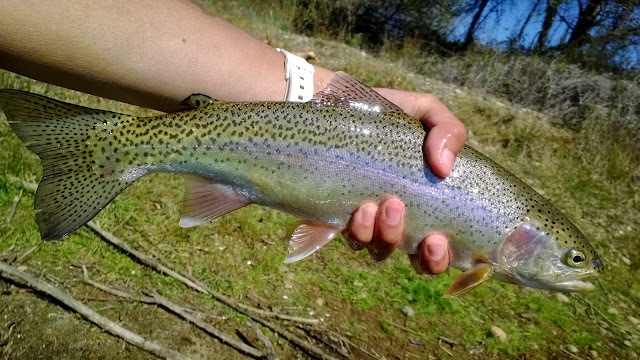 After wading further downstream, I hooked another fish that did the exact same thing except this time it didn't unhook itself. 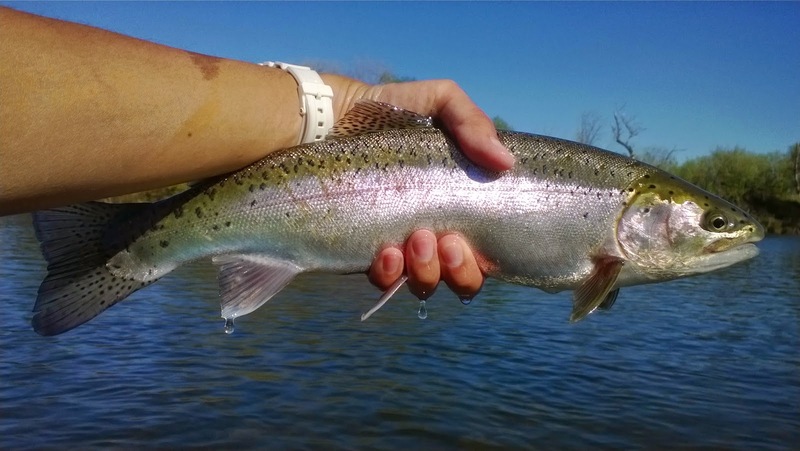 The spring-run steelhead are a feisty fish that can really test a fly angler's fish fighting ability. The fish made hard headshakes back and forth, would dart out every now and then downstream making my reel scream, and slowly swim towards me forcing me to strip in fast to keep a tight line. I fought him like a champ, landed him, took a picture, and let him go. It felt refreshing to be back in the game. While fishing the run, I had one more hit but not a commitment. With no luck, it was time to waded back to my car and drive further upstream. While covering water downstream, I finally figured out where the fish were holding. Deeper water! My strategy worked and I found a nice fish and several more in the riffle below. I left the Feather river at around 5pm, therefore I fished around 12 hours today for three fish landed, two lost, and a lot of uncommitted hits. Total worth. I will be taking it easy tomorrow as there are things around the house that need to be done. What a wonderful three days.